Cannes Lions is a conference for design, tech and media industries held each year in Cannes, France. 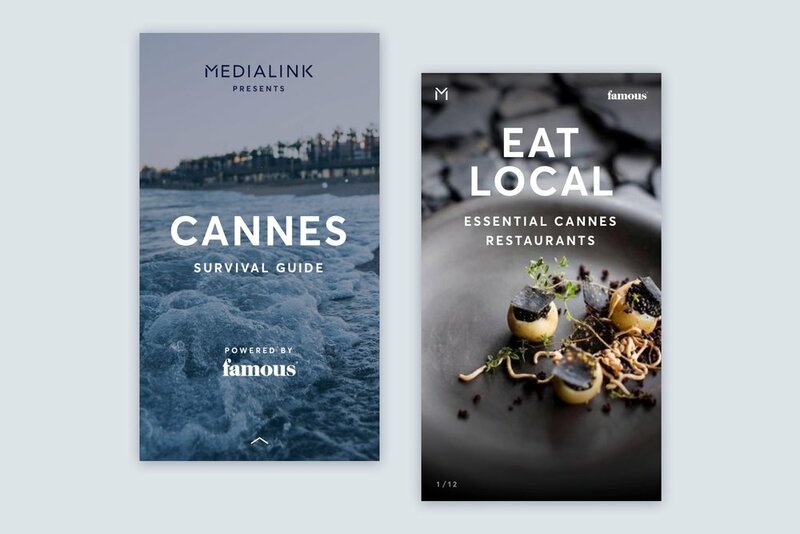 Medialink sponsored a round of talks, and asked Famous to create a guide including a program, restaurant guide, and essential French phrases. The goal was to encourage time on brand for Medialink while providing useful information to conference attendees. I designed the schedule with a simple image of a cocktail, in case anyone missed that drinks were included! We chose 2 restaurants to feature for their high ratings and proximity to the conference venue. Average time on brand was 1 minute and 24 seconds, with almost all users completing the entire guide. The final CTA saw a click-through of 23%. "The app is gorgeous! Thank you so much!!"